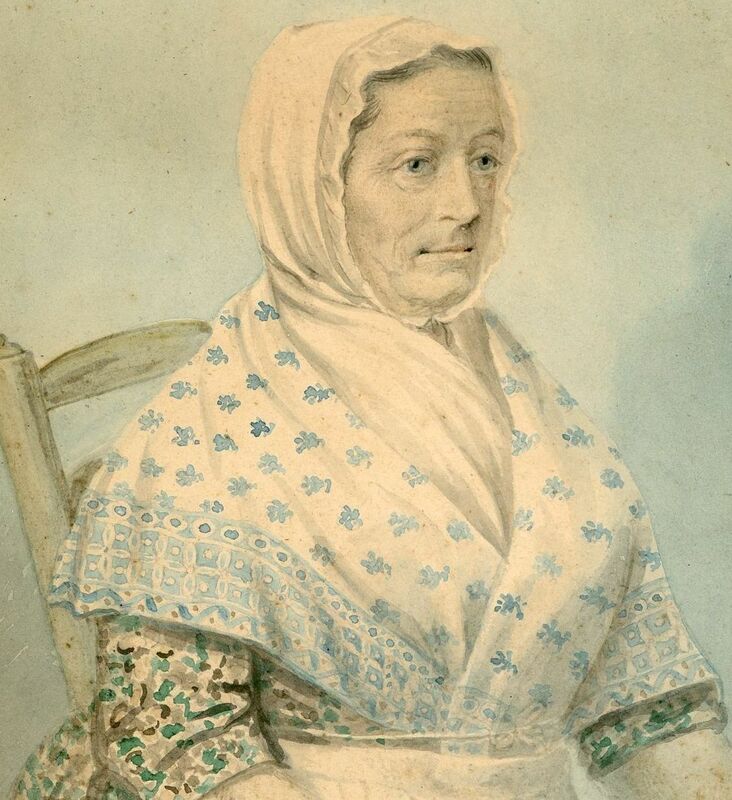 “Painted from life”, this portrait shows Mary Bewley, often dubbed “Goody Bewley” with her most precious possession, a Bible, that was gifted to her by Princess Charlotte, the only child of George IV. Mary’s husband was a garden labourer at Claremont, home to Princess Charlotte and her husband Prince Leopold. The story goes that the royal couple were out for a walk one Sunday afternoon when they spotted Mary at her cottage door with an old book in her hand. Upon enquiring what the book was, Mary responded that it was a Testament but that the print size was very small. 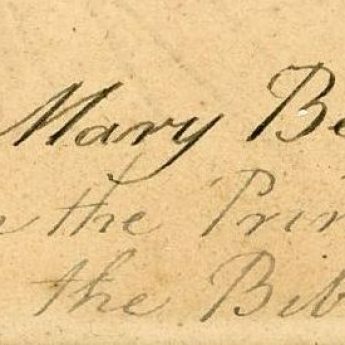 A few weeks later the royal couple called upon Mary again and presented her with a beautifully bound quarto Bible. 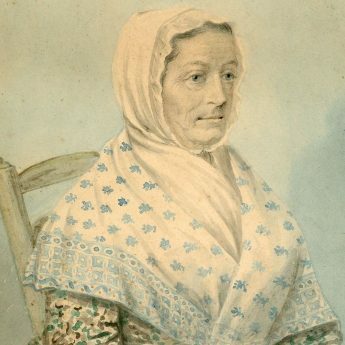 Hidden within its leaves Mary later found two £1 bank notes. 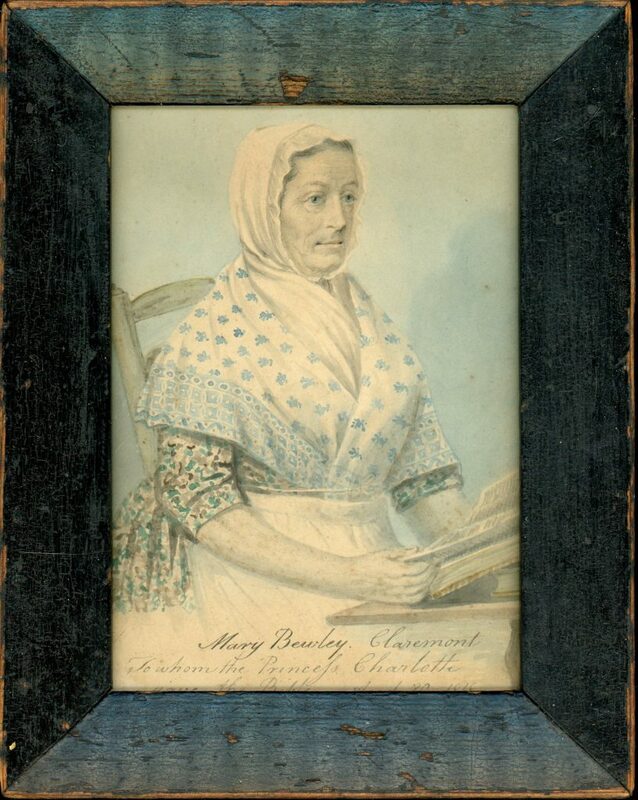 This small watercolour is painted on card and is entitled in the artist’s hand “Mary Bewley Claremont / To whom the Princess Charlotte / gave the Bible. Aged 80. 1818”. The signature “Drawn from Life by D. Orme” is concealed in the bottom corner by the stained pine frame. Daniel Orme (1799-c.1832) was the son of a Manchester merchant. He entered the Royal Academy Schools in 1785. In addition to painting small portraits, he was appointed engraver to George III.